Picture courtesy of the Tennessee Suicide Prevention Network. There is nothing better than the feeling of knowing you spent your time in a productive manner that is going to make a difference. That is how I felt last month as a student in the Applied Suicide Intervention Skills Training (ASIST) interactive workshop, which was presented by the Tennessee Suicide Prevention Network (TSPN). I am now ASIST certified and better equipped to make a difference in the cause of suicide awareness and prevention. In 2018, I became a suicide survivor when my younger brother died by suicide. It is a telephone call I never thought I would receive. Suicide is an act only familiar to most from what they read or hear in the news or through social media. It happens to other people in other families; just like every other tragedy. You never think it could or will happen to someone you love. His death gave me a new purpose to learn more about suicide and an eagerness to help those struggling with depression and suicidal tendencies, and the survivors who are left behind. According to the American Association of Suicidology, the suicide rate in Tennessee has dropped since 2005, but remains twenty-second in the country. You may see the statistics for Tennessee, which includes children and teenagers. It is alarming and sad that the numbers continue to grow. Suicide is the third leading cause of death for people, ages 15 through 24, and the tenth leading cause of death in the state. 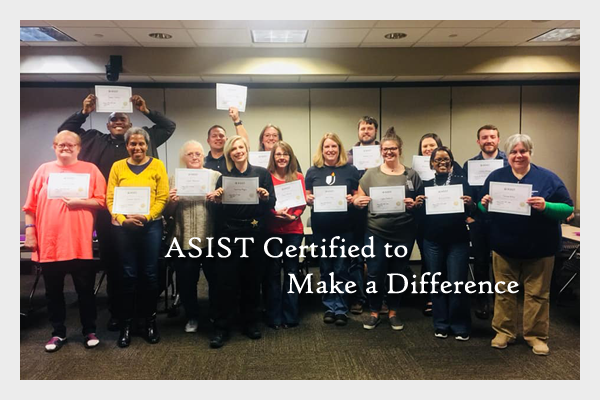 Now that I am ASIST certified, I can apply my suicide first aid education to help me identify a person who may be at risk. The goal is to “create a plan that will support their immediate safety”. My training does not guarantee I will always be successful in saving a life. What it has done is given me tools, so my response will be more educated than it was before I completed the workshop. I pray I am able to help someone who is suffering and possibly prevent another family from experiencing the loss of a loved one to suicide. Although people who may be considering suicide or die by suicide do not always exhibit these warning signs or have these risk factors, it is good to be familiar with all of them. The ASIST workshop is open to any people who are 16 or older. The training is usually taken by healthcare, law enforcement and emergency professionals, but the information can benefit anyone. If you are a teacher, in ministry, a counselor, a parent or someone who comes in contact with other people (everyone), there is something you can gain from becoming certified. No previous training is required. Another way you can support the cause of suicide awareness and prevention is by purchasing a specialty license plate for only $35. One thousand signatures/purchases are required for production of the license plate to begin. Tennessee would be the first state to have such a license plate. If the required number of signatures is not collected by Friday, June 28, all funds will be returned. Hopefully, one thousand purchases will be made and production will begin. I believe the visibility of the license plates will result in people feeling freer to discuss suicide more openly and give those struggling with depression and other mental illnesses the courage to seek help. If you or someone you know is struggling with suicidal thoughts, you may text anonymously to TN to 741741 to the Crisis Text Line for Tennessee or call the National Suicide Prevention Lifeline at (800) 273-TALK (8255) and reach out for help. Also, feel free to contact me if you have any questions about how you can help promote suicide awareness and prevention, are a survivor and want to talk, and/or just want to talk.